In a bowl, mix together the diced onion, garlic, shredded potato, egg, tomato paste and spices. Add the rice, stir to break up the rice and coat the grains. Place the meat in the bowl with the other ingredients and mix thoroughly. 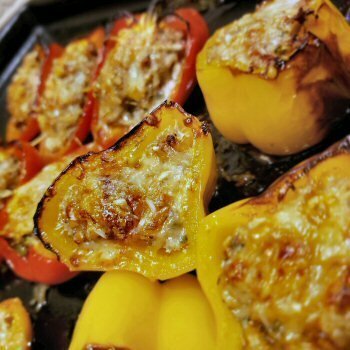 Hollow out peppers and fill with equal portions of the meat filling and place in a roasting pan (square ones work well for this). Grill indirectly or oven roast at medium heat (about 350 F) for approximately 20-40 minutes (depends on the size of the peppers). The best way to know when they are done is to check with a thermometer and the meat has reached 165 F. Awesome as a side dish or as a main course! Penne with Spinach, Tomato e Gusto!